Until I devised a great checklist that I put on the kitchen counter before they arrive home. If you have the same nagging issue print up this list for them to use every day. Then step back and enjoy their ability to 'get it done'. Perhaps if you are at work when your favorite students arrive home this list will help give them some direction until you arrive home. Save this .jpg to your computer and print it up as an 8x10. Or use it as a platform for your own checklist. Just open up Word, make your list, make the font size large so it is easy to read & to cross out or checkoff what they complete. Place your checklist in to a plastic sheet protector like these from Amazon.com. (Avery Diamond Clear Heavyweight Sheet Protectors, Acid Free, Pack of 25 (75304)) You can find the sheet-protectors at your local Exchange, Target, WalMart or office supply store, too. Now keep it on a clipboard with a dry erase marker. Your student can check off what they have done as they go along right on to the sheet protector. When you have verified it is all done just wipe it off with a clean towel and it is ready for use again tomorrow. 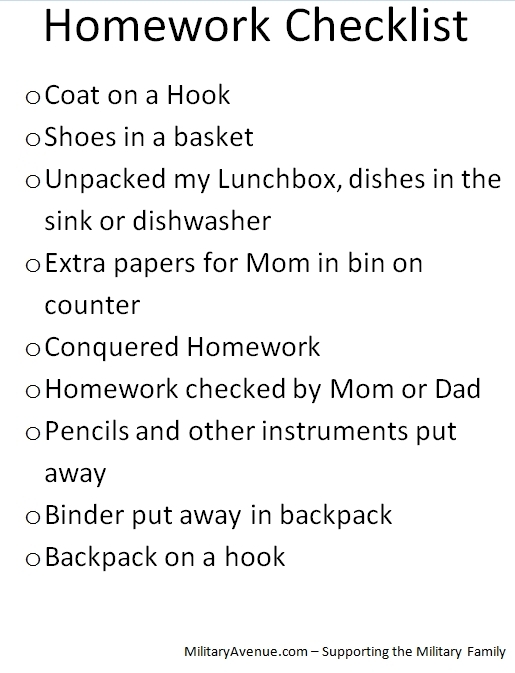 This "Homework Checklist" keeps homework time organized, a bit more clutter free and there is a whole lot less nagging. Amen, Amen and Amen! Leanne is the mom to two school aged boys, in 2nd and 4th grade. She is also the mom to a 2 year old and step-mom to a freshman in college. She has run the gamut of ages and has stumbled through motherhood with a smile on her face, a glass of wine in her hand, a checklist in her mind and the wonderful feeling that Hubs, her soldier, her rock, will be home soon, please tell me he'll be home soon.